No, the Upfield Line was closed North Melbourne - Flemington Bridge May 1997 to February 1998 while the Citylink viaduct was build overhead. The station office has relocated to the carpark ahead of demolition work next month, during a 6-week shutdown which will also the viaduct completed across Overton Rd 1km away. PTV have released a detailed summary of upcoming works on the train and tram networks over May and June. It doesn't seem to cover works into July at this stage. The works between Caulfield & Westall will see the final stage of the Skyrail open and four more crossings disappear, although the new Hughesdale Station opens later. Craig wrote: PTV have released a detailed summary of upcoming works on the train and tram networks over May and June. It doesn't seem to cover works into July at this stage. They are really going overboard on the works. To the point there's just no point trying to use public transport. Easier to drive everywhere. Lots of issues today with trains in the south eastern suburbs due to equipment failures on the Dandenong line between Clayton and Noble Park. 14:20 Southern Cross - Traralgon is delayed by approximately 184 minutes due to an ongoing track fault in the Metro area. Riding on a Sprinter for 5.5 hours to reach the Latrobe Valley wouldn't be the most pleasant of journeys! Most City Circle movements these days are usually empty runs just to get the train out of Flinders Street and back again in about twenty minutes to free up a platform. Having said that there’s usually one scheduled to leave Flinders Street around 630 Monday to Friday on plantform 1. Apart from that I don’t believe there’s any actually scheduled. Spotted a broken/pulled apart rail on route 78 (Chapel St) immediately south of the Toorak Rd intersection on the southbound line last night. It's right on the pedestrian crossing and the concrete is also cracked around the break. Rode A2 300 on route 75 from Vermont South to Glenferrie Rd last night, obviously on loan from Kew to Camberwell as the interior was still fitted with Kew route stickers. I also saw two A classes (I took a short trip in 289) on the 109 light rail heading to Box Hill in the late evening, which is unusual as the As are normally only on the 48 after evening peak has ended. Whelp, time for PTV to update the information on their website once again now that the Mernda Extension has started service. 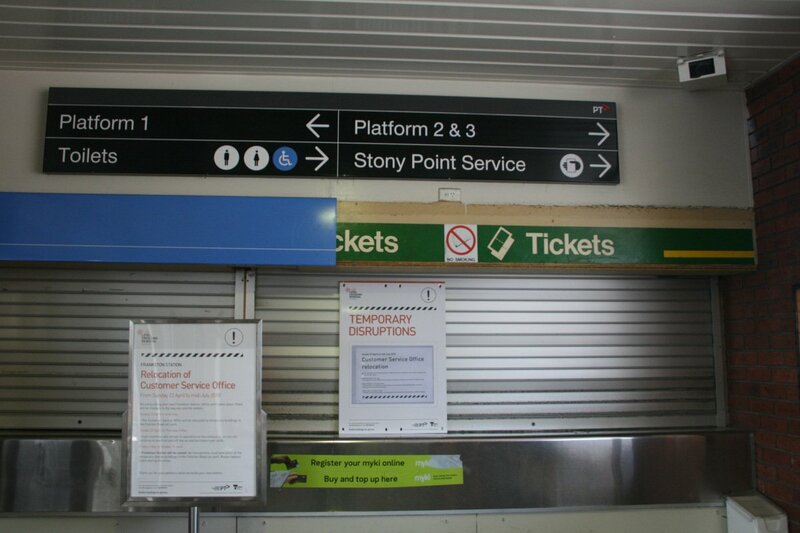 BanksfielderIdiot823 wrote: Whelp, time for PTV to update the information on their website once again now that the Mernda Extension has started service. It's also time for PTV to update the route description as it still shows City Loop services operate anti-clockwise on weekends. These services have operated in a clockwise direction every day of the week for about 6-7 years and I reported this to PTV some time ago. In January this year I also reported bus timetable errors to them but those weren't corrected either, so it shows how incompetent they are. Richard1207 wrote: It's also time for PTV to update the route description as it still shows City Loop services operate anti-clockwise on weekends. These services have operated in a clockwise direction every day of the week for about 6-7 years and I reported this to PTV some time ago. In January this year I also reported bus timetable errors to them but those weren't corrected either, so it shows how incompetent they are. City Loop Anti-Clockwise on weekends? The hell PTV?!? EDIT: Damn it, it was November 2008. April was the first stage; the city loop changes were from the second stage that was November. My memory fails me sometimes. Last edited by BanksfielderIdiot823 on Tue Aug 28, 2018 10:56 am, edited 3 times in total. BanksfielderIdiot823 wrote: Yeah, the Clifton group hasn't done the loop anti-clockwise since before April 27, 2008. Weekend trains coming from the South Morang and Hurstbridge lines operated anti-clockwise through the loop between November 2008 and December 2013. Prior to those changes in 2008, weekday trains on that group operated anti-clockwise until lunch time, then switched to clockwise operation for the rest of the day, exactly the same as how the Burnley and Caulfield loops still operate, whilst all weekend services used to operate clockwise through the loop. Last edited by BroadGauge on Tue Aug 28, 2018 11:54 pm, edited 1 time in total. BroadGauge wrote: Weekend trains coming from the South Morang and Hurstbridge lines operated anti-clockwise through the loop on the Hurstbridge and South Morang lines between November 2008 and December 2013. Thanks for that. I corrected my original post after I remembered at the last minute no thanks to my slow memory. A couple of big weeks coming up with the Newmarket - Essendon and Dand - Cran shutdowns already under way, followed by a full weekend and a few nights of FSS - Caulfield Shutdown along with the tram route 86/96 16 day shutdown also about to commence. Just dropping a little bit in here for any visitor coming in wanting to know what tram it was that was recently taking the two royal tourists down to South Melbourne Beach via the #1 route in case they've missed the number, that tram was B2 2088. Noticed today A1.236 has had its traditional gong replaced with a electronic one. Not spotted by me but the very first HCMT set has been transferred from Newport to the HCMT-only Pakenham East depot under the cover of darkness, hauled by 4 SSR locomotives and their grain wagons which were used for braking. Only one video has been found, which also isn't mine. A very busy December with Shutdowns on the Pakenham/Cranbourne lines for the next 23 days, plus route 64 tram replacement until I think the 10th, Gippsland shutdown in its entirety until 17th plus Ballarat shutdown from the 8th until I think the 14th. Southern cross interchange will be a hive of activity. One of the aircons above 1357T was making a fair amount of racket, I caught this set on a down Lilydale (or Belgrave) Night Network service in the early hours of Saturday morning.